When graduating from law school, you are thinking about the ideal first job with a good law firm, maybe the large one, maybe the mid practice. Then time goes on and you figure out pretty quickly the way to the top is to “bring in new clients” i.e. billable revenue baby! So like most lawyers you have exhausted your friends and family networks in your early years as a lawyer, built some new business but trying to figure out how to take your law practice to the next level. But the one common thing I hear every day is “lawyers are not good marketers”. Well, I’m not a good contract writer, I don’t have the patience to read through 100’s of legal pages and I didn’t have the patience to go to law school. I’m pretty sure, lawyers are lawyers for a reason, to practice law. And I’m a marketer for a reason, to do great marketing. When I have a problem or need legal help, I don’t try to get up at 11pm at night trying to be a “Google” lawyer. So you “Mr. Attorney” shouldn’t be sitting up at 11pm trying to figure out digital, social and mobile marketing to grow your business. Let’s talk about where you “think” your clients are coming from and where they “are” coming from. Last year (October to September 2015), 14.6 million people on Google alone (not Bing or others), conducted searches related to “finding a lawyer”. 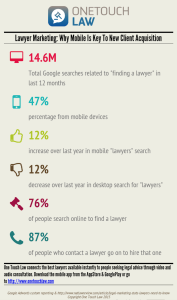 That was up 17% growth of online searches for lawyers in less than 12 months. So how are you getting folks to call into your office today? Referrals, Yellow Pages, billboards, TV commercial, social media, website, Google Adwords, lawyer directories? How do you know what is working? If I asked you [pick a source above}, How much does a new client cost you from Google Adwords? Do you know the new customer acquisition costs? 1. Do you have the technology to track your spend? 2. Do you have a receptionist/paralegal answering your phone? 3. How long does it take you to call someone back after they first contacted you? 4. How long does it take you to respond to an email for new business? 5. How are your sales skills? These are the questions I always ask to help a lawyer think more about their current lawyer marketing situation. 1. 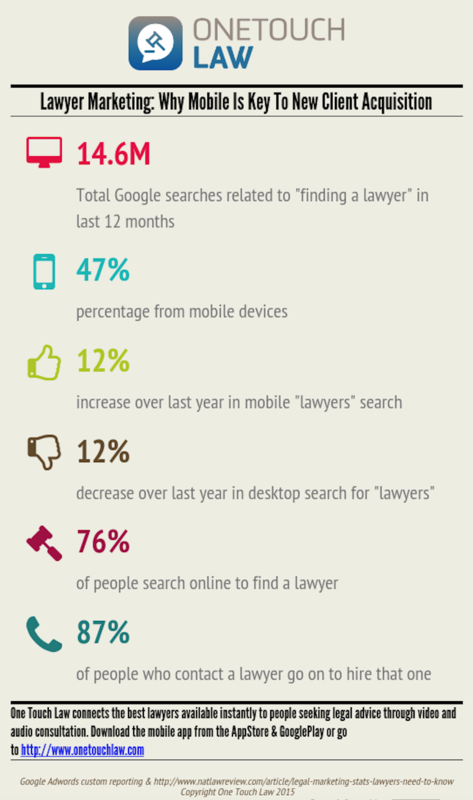 76% of people seeking a lawyer are searching for them online. You must have a good website and more importantly a mobile website. Even if you aren’t spending thousands of dollars on Google Adwords, if you have a mobile website you will place higher than large law firms that don’t have one, given the new Mobilegeddon that Google rolled out in April this year. It’s critical to have a mobile website for your law practice that enables potential clients to see your contact information, instantly from their mobile device and “click to call” you easily. 2. 87% of people who contact and speak with a lawyer go on to hire that one. Why is this super important? We live in world were the expectation is we want everything at our fingertips and that includes speaking to a lawyer. We don’t have the patience for “lawyer directories or email forms” where we fill them out and patiently wait several days for a call back. If we get a lawyer on the phone, discuss our issues and like them, were moving ahead, we don’t have time to waste. Especially in the case of “immediate” law services, the stress of a legal situation is bad enough, the anxiety of not having a lawyer and searching for a lawyer can make it worse. This is why One Touch Law was founded. Two entrepreneurs were frustrated in the dinosaur process of finding a lawyer. After many online directories that “identified” good lawyers, actually reaching out to them was a different story. We were ready to hire one, had the money to do so but were tired of talking to receptionists, emailing and leaving voicemails. We thought in today’s world of the social A-D-D consumer and business owner (me), we couldn’t be alone. 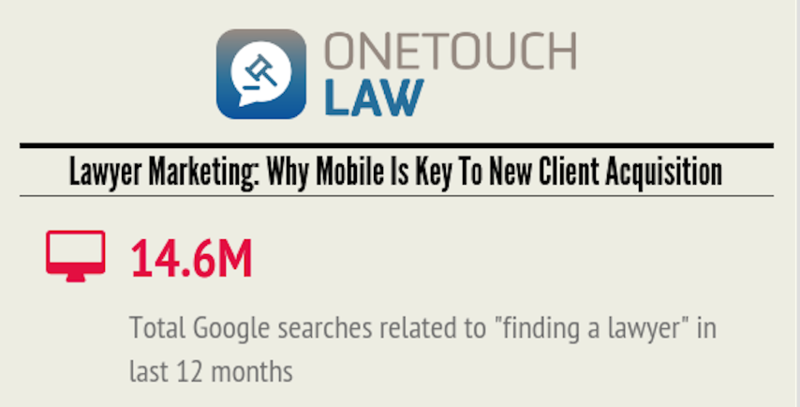 One Touch Law’s mobile app, connects the best lawyers with people seeking legal advice instantly through our patent pending technology. Lawyers schedule themselves of when they are actually available to take video and phone consultations, people seeking legal advice can see who is available right now, and with the touch of a button they can connect in real time. This has proven highly beneficial to both parties. We want everything at our fingertips instantly so why should finding a lawyer be any different. Lawyers can sign up at www.onetouchlaw.com and people seeking legal advice can download the mobile app from the AppStore or GooglePlay “One Touch Law”.